The assignment was to create an article as if we were reporters and present it as if we were working for a magazine. We were free to choose the style, color palette, layout, margins, etc. However, the main grading criteria would be the typography and layout chosen. I initially thought writing about Claude Garamont but, during my preliminary research, I stumbled upon the name of Beatrice Warde. As a newbie to Graphic Design, it surprised me how she could be linked to the introduction and revival of many font typefaces that are, still today, considered as exemplary typographic works. 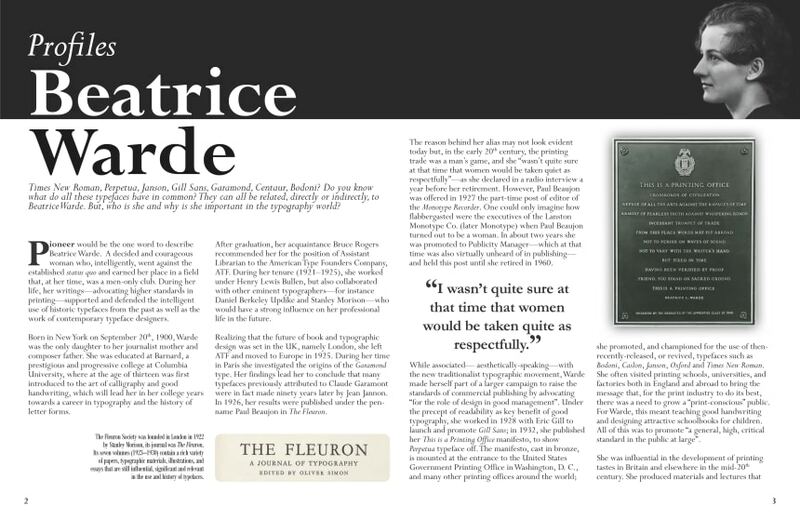 Beatrice Warde is those kind of people whose life could easily be adapted to a movie; in an men-only industry at the time, she had to present her research under the male pen-name Paul Beaujon—so her results could be taken seriously. Her findings got her Paul Beaujon persona a gig at Lanston Monotype Co. (today Monotype), astonishing the executives that hired Paul Beaujon and expected a man in lieu of a woman, namely, Beatrice Warde. During her work as Publicity Manager (say whaaat! A woman publicity manager in the 1920s? that's just crazy talking :D), with her great skills as a communicator and even greater style taste, she was able to raise the bar in sophistication in advertisement and, most importantly, she advocated ferociously to improve the quality of educational printing materials and create a "print-conscious" public. In her memory the Type Directors Club—whose first female member was Beatrice Warde herself—offers since 2015, and in conjunction with Monotype, The Beatrice Warde Scholarship to any female (born or identified as such) student enrolled in her junior undergraduate year of studies. The scholarship consists in US$5,000 towards the recipient's senior year tuition fees (Read more…). Mrs. Warde is like those bands that have a great repertoire, are relevant to the history of music and, somehow, remain relatively unknown outside the circle of the field's connoisseurs. Without further ado, here is the PDF file with my article About a Designer entitled: Profiles: Beatrice Warde. The main text body in the document is written with Perpetua typeface, honoring the This is a Printing Office manifesto written by Warde to present this precise typeface. I hope you like the article and that it could inspire you as well. This work (Profiles: Beatrice Warde) is licensed under a Creative Commons Attribution-NonCommercial-NoDerivatives 4.0 International License. Copyright for images and fonts used in the article belongs to their respective owners and are used for educational purposes, under assumptions of fair use.